Banking innovation. Volksbank Bühl, one of the 1,100 cooperative Raiffeisen banks, became the first German bank to offer their customers a regional crowdfunding platform. 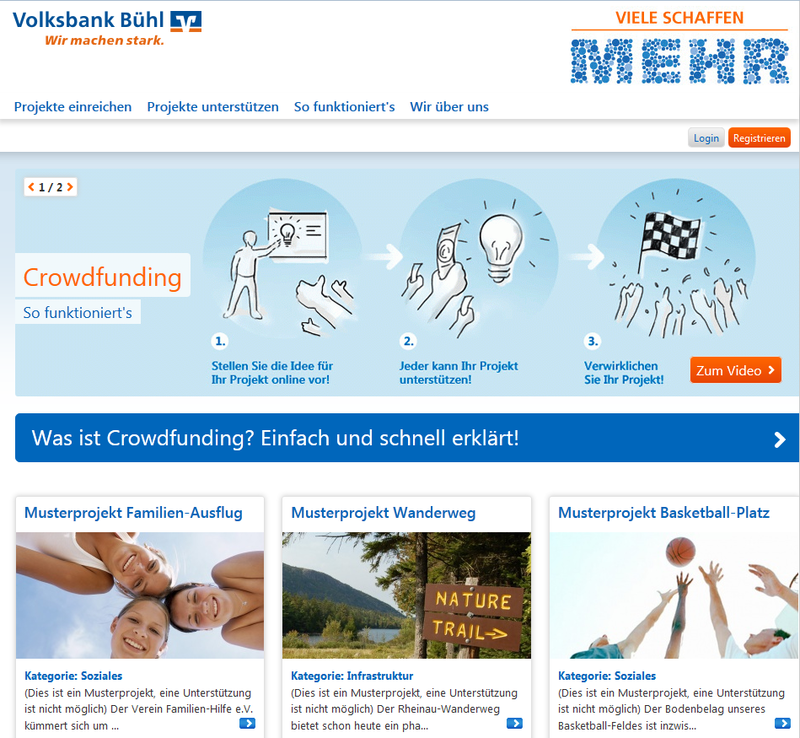 Today, Monday 29th April 2013, Volksbank Bühl (@Volksbank_Buehl) became the first of the People’s cooperative banks to have access to its own crowdfunding platform to support online regional projects. This innovative platform, available at Viele-schaffen-mehr.de – Crowdfunding in der Volksbank Bühl, is provided by VR-NetWorld GmbH, goes with the motto, “Many make more!”. Crowdfunding is a new finance model that finances many online projects of the people from Buhl, Steinbach, Ottersweier Rheinau Lichtenau Rhine Munster. These people are given the opportunity to use the platform on their regional projects and solicit support. Moreover, pro jektunterstützer can select their favoured projects and invest in them. Regardless of the amount of the donation, the bank sets example to the first 2,000 contributions. The platform was developed by VR-NetWorld (@vrnetworld) in partnership with T-Systems (@tsystemsde) and Startnext Network (@startnext), the most successful crowdfunding platform community in Germany. To find more about this initiative pushing the envelope for banking innovation directly on youtube, ‘Viele-schaffen-mehr.de – Crowdfunding in der Volksbank Bühl‘. Unarguably, in the highly regulated financial services industry, social media and peer-to-peer (P2P) initiatives are most suited to the cooperative banking model i.e. all the regional banks and other credit unions focusing on communities. It’s not surprising that in the last three years, financial institutions like USAA or Credit Agricole demonstrated a commitment to push the innovation envelope with digital initiatives such as, respectively, over 90% of its website made of customer generated content (Voice of the customer – VOC) or Tookam.com a 100% social media bank launched 2 years ago in the South West of France. In your opinion how important is it, or not, for small regional banks to be at the forefront of innovation? Would you be more likely to fund local projects or aim to fund your own projects via a crowdfunding platform provided by a cooperative bank than a larger financial institution operating nationwide? We invite you to share your thoughts about crowdfunding and regional cooperative banking, here or on twitter.